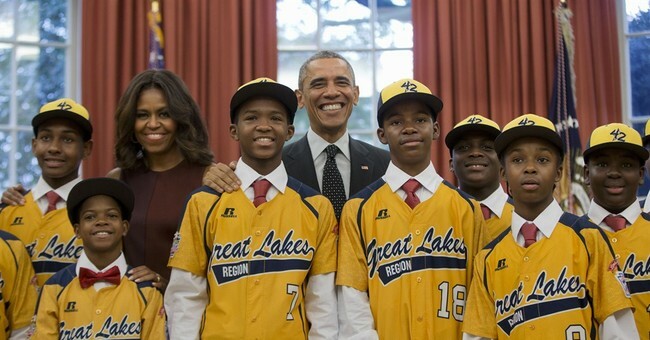 With the announcement that the winners of the 2014 Little League World Series, the all black ‘Jackie Robinson West’ team based out of Chicago had improperly and against the rules recruited youths from other areas, basically padding their roster with ineligible ‘ringers’ in order to win the championship, the Little League governing body stripped the ‘Jackie Robinson West’ team of their title. True to fashion, Democratic Party members flocked to the team’s defense, including the expected claims of racism from Jesse Jackson. It mattered not to Democrats or the so-called ‘Reverend’ Jackson that the team violated the rules and cheated in order to win the championship. Instead of receiving a lesson in honesty and accountability, Chicago Mayor Rahm Emanuel has announced that the boys will receive championship rings, more than likely courtesy of the Illinois taxpayer. It didn’t matter to the coaches and the parents of the young men on the team that the boy’s achievement was tainted and attained improperly. That it was built upon a lie. And none of that was of concern to the Democrat supporters of the team either. In Democrat circles honesty and integrity are the character traits of fools. Just look at who they select to be their party’s leaders! Bill Clinton’s lies and sexual predations throughout his career are completely ignored and overlooked. Bill Clinton is a rock star at Democratic Party gatherings. Most likely the next Democrat Party nominee for president, Hillary Clinton’s record of lies and deceit are as legendary as her husband’s are. Her record of lying goes way back to her days on the Watergate Committee when she was fired, by a Democrat no less, for dishonesty and unethical behavior. When you factor in her missing Rose Law firm billing records that mysteriously showed up in the White House years after being subpoenaed, with no explanation how they just ‘appeared’ in probably the most secure structure on the face of the earth, it strains credulity. Hillary’s career has been built upon lie after lie after lie. While still Speaker of the House, California Democrat Nancy Pelosi denied ever hearing about the CIA enhanced interrogation technique called ‘Water-boarding’, even though she attended a number of meetings where water-boarding along with the other techniques were clearly spelled out by representatives from the CIA to the assembled legislators. Including Ms. Pelosi. If her denials were true which they are not, that she didn’t know anything about water-boarding after attending these meetings then that alone speaks of her incompetence and being unfit to hold office ! But Ms. Nancy simply denied it all and then blamed it all on the CIA for “lying” to her. Talk about the pot calling the kettle black. Which brings us to Barack Obama. His denials of knowing terrorist Bill Ayers and claiming not to have heard Jeremiah Wright’s inflammatory anti-white and anti-American preaching in a church Obama attended for twenty years is just plain not credible. The list of Obama’s deceit is far too long to list here, but suffice it to say that even Bill Clinton must be shaking his head in amazement that anyone could top the whoppers he has told throughout his political career. While the young men on the Jackie Robinson West baseball team may or may not have understood what was going on, the message that is being sent to them is clear as a bell. That it’s ok to lie, cheat and steal to get ahead. And this Little League championship was clearly stolen from other teams who played by the rules. But instead of universal condemnation being directed at the parents and coaches who perpetrated this disgrace and holding them accountable, or teaching the young men that there are consequences for one’s actions, as is typical for Democratic politicians they have rallied around the team and denounced anyone who supports stripping the team of its title . You see, Democrats are all about lies and deceit. Lies and deceit they have been telling and practicing for decades. How otherwise could they still be a viable political party in America ?